The Asian Human Rights Commission (AHRC) strongly condemns the custodial death of Ram Manohar Yadav, 30, a resident of Janaki Rural Municipality, Banke district. Yadav died in Police custody while on the way to Kathmandu for medical treatment. Police had admitted him to the Bardiya District Hospital in Gulariya and subsequently to the Bheri Zonal Hospital in Nepalgunj, where he was ordered to be placed in the Intensive Care Unit (ICU). He had collapsed in custody for reasons yet unknown. It appears that Ram Manohar Yadav, who was on medication for hypertension, died on the night of August 31 mainly because the police did not take him to hospital in time. Ram Manohar Yadav’s family members, who could have supplied him with hypertension medication, were not allowed to meet him after his arrest on August 23. Yadav then asked the police for hypertension medication, but the police refused to give him any. Ram Manohar Yadav, who suffered from severe headaches due to hypertension, was found unconscious at 5 a.m. on August 30 by fellow detainees. The detainees informed the police, following which the police first took him to Gulariya District Hospital, and later to the Nepalgunj based Bheri Zonal Hospital. There was no ICU available for Ram Manohar Yadav in the hospital, so doctors referred him to a hospital in Kathmandu. Instead of promptly taking Ram Manohar Yadav for the necessary treatment, the police said they could take him to Kathmandu only if his family members signed a document agreeing that they would be responsible if anything happened to Yadav during the course of transportation. Ram Manohar Yadav’s condition deteriorated as he failed to get immediate care. Only after the Terai Human Rights Defenders Alliance (THRDA) issued a press release urging all not to create obstacles in Ram Manohar Yadav’s treatment, did the police act. On August 31, the police put Ram Manohar Yadav on oxygen support and transported him to Kathmandu in an ambulance. Upon arrival at Tribhuwan University Teaching Hospital (TUTH), doctors declared him dead on arrival. Ram Manohar Yadav, who was a district member of the Alliance for Independent Madhes (AIM), was arrested on August 23 from the auditorium of Bardiya District Coordination Committee along with Western Regional Coordinator of AIM Irfan Ahmed Sheikh, District Co-coordinator Harpal Singh Sodi and District member Rajit Ram Verma, when they had gone to attend a programme scheduled to be addressed by Deputy Prime Minister (DPM) and Health Minister Upendra Yadav. The police arrested these people mainly because they feared that they could pose questions to DPM Yadav regarding the Madhesh movement. The group waived a black flag against DPM Yadav while they were being arrested. They were charged under the sedition law and were sent to the District Police Office Bardiya. These individuals have been arrested, tortured and even threatened with death by the Nepal police several times in the past too. On 19 March 2016, they were arrested them from an informal meeting and charged with sedition. They were cleared of these charges on 15 February 2018. 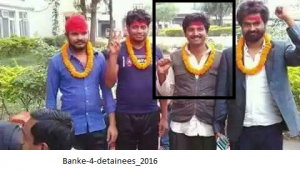 On 25 November 2016, they were again arrested from Nepalgunj, while celebrating “Anti-Racism Day”. They were severely beaten and tortured in custody, and then released on November 27, after which they were airlifted to Kathmandu for medical treatment. Subsequently, on November 29, they filed torture complaints with various human rights bodies, including Amnesty International and the National Human Rights Commission (NHRC) in Kathmandu, personally meeting them and showing their torture injuries. They had even filed a torture case against Banke District Police in the Banke District Court, but the police have been threatening them to withdraw the case ever since. On 16 June 2017, they were again arrested prior to the local elections, for allegedly campaigning for “no vote”, and were released only on 3 July 2017, on the order of the Tulsipur High Court. Ram Manohar Yadav’s family members have tried to file a First Information Report (FIR) case against Superintendent of Police Surendra Prasad Mainali, so that they could emphasize on a post-mortem examination, but Maharajgunj Police Circle, Police headquarters – Kathmandu, and District Police Office – Banke did not register the complaint. It is mandatory for a complaint to be filed for conducting a post-mortem. 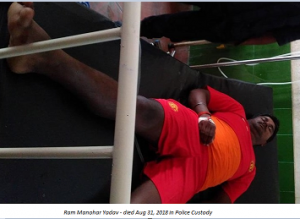 The AHRC condemns the Nepal Police for repeatedly torturing the detainees in custody, and the negligence in Ram Manohar Yadav’s medical treatment. The government must ensure a free and fair time bound investigation in this case of alleged custodial killing, and punish those found responsible. The police must lodge the complaint so that a post-mortem can be conducted. The government must also ensure that compensation is provided to Ram Manohar Yadav’s family. The government must also secure the immediate and unconditional release of the remaining detainees.